A simple definition of Parallax would be “an apparent change in the position of an object resulting from a change in position of the observer”. By some accounts on October 12 Christopher Columbus arrived in the Americas . 521 years later a girl, Malala Yusufzai, from Swat, Pakistan met President Obama. President Obama stated “Across the globe there are girls who will one day lead nations, if only we afford them the chance to choose their own destinies.” Both Pakistan and Bangladesh have had women Prime Ministers. A lady has never been elected to the President’s office in the US. In 2007 30% of Iraqi elementary school children attended school  as opposed to 75% previously. Between the 1990 and 2005 the increase in infant mortality in Iraq of 150% was the highest in the world, a period that saw inhumane sanctions and a war based on greed  , an IMR had by contrast declined from 120 per 1000 in 1960 to 45 per 1000 in the late 1980’s. Some charge Muslims with trying to take over the West, forgetting conveniently that Iraq alone has lived the nightmare of foreign takeover multiple times. A 1920 “uprising” was crushed by Churchill through the RAF with Winston itching to use chemical weapons  and authorizing a brutal bombardment  of the “enemy” who happened to be the native of the land being occupied. The exact death and destruction from Iraq from first gulf war is still an obscurity in the media, so there is no surprise that the mortality and morbidity from the latest fiasco is manufactured in to a question mark. The Lancet study concluding 650,000 excess deaths and by some counts well over a million are disputed by the same media that John Kerry uses to drum up support for yet another war, this time in Syria shoulder to shoulder with Al-Qaida , backed by “numbers” pouring in thick and fast. Fortunately, the sanity of American people prevailed over a proxy war between Turkey, Saudi Arabia, Israel, USA against Iran and Russia presented as yet another divine call to protect the weak by the media. In school curriculum by our colonial masters, we found the names Christopher Columbus and Ferdinand Magellan. One of the first things to relearn about Columbus is that he was by no means the only one who believed that the earth was not flat. Second and more importantly, he conducted a shameless genocide of the indigenous population. In the schoolbook version in Pakistan and the US, he was an intrepid explorer, inspired by his faith as much as curiosity and “discovered” the “New World” because the Ottomans had blocked off the land route to India, the latter an assertion challenged by some as it was a money making venture for the Ottomans. In this day and age of connectivity it is hard to keep old myths alive let alone build new ones. One finds that Columbus was welcomed by an indigenous population only to return with arms and annihilate them. The “New World” was already home to an indigenous population, 90 to 95% of who would be wiped out in a single generation. The cause of this remains controversial and although disease from the “old world” did play a role, genocidal violence had very clear role as well, the people of the old world having the advantage of newer weapons unknown to the indigenous. In American Holocaust, David E. Stannard writes that in 21 years after Columbus came to the Caribbean, it went from a population of 8000,000 to be being desolate. The numbers and causes seem to get more obscure the more inconvenient they are to the myth of a linear unblemished history. The war on the natives was not despite faith but done in its very name as “the Requirement” would be read out to natives, imploring them to recognize the Church and Pope or be ready to face war declaring explicitly that women and children will be taken as slaves. Only a fool would use this as a reference to approach Christianity in general yet a similar bias is used for Islam daily in the media. The current Palestinian-Israeli conflict becomes just another chapter, overlooking the fact that at the time Columbus sailed from Spain under Isabella Ferdinand, one of the most luminous chapters of coexistence  were coming to an end, that is the Spain under Moorish rule which was not perfect, but would still make us question the world that we are shaping since 9/11. In Spain Christians, Jews and Muslims had come together to make advances in art and science that Europe would owe its emergence from the dark ages to. Under Isabella and Ferdinand in Spain came the Spanish Inquisition, Jews and Muslims were expelled, even co-religionists were persecuted on suspicion of being fifth columnists. By contrast Jews and Christians had freedom of religion under the Moors   and in fact many Jews were forced to flee to Ottoman lands. 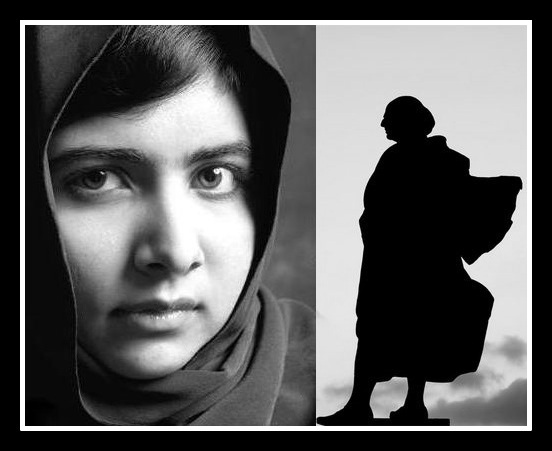 One has to be careful of the lessons learned from Columbus, just like one must not reduce Malala’s wonderful story to a conspiracy theory despite the undoubted exploitation by some. In a time of unprecedented propaganda we can fall to the temptation of our own parallax error – of creating our own “other.” However, we have to advocate that West and Islam question sincerely our biases, from a distorted history of the Crusades to the temptation of a religious transference. The historical place of women in Islam and their roles are very different from what the exploitation of Malala would suggest. It is overlooking that just like early Christians, early Muslims were persecuted and the first martyr of Islam was Sumayah (May Allah Be Pleased with her) was a lady, killed when a spear was thrust through her private parts. It was the background of such victimization that Quranic verses of retaliating were revealed. Most importantly, Columbus was a myth built over 500 years but took a few days of research in this day and age of the technology to dismantle. Those trying to reduce the violence of the last dozen years, both by a lunatic and fringe that has killed more Muslims than anyone else as well as by elected governments taking their people to wars based on lies, to the face of a young girl need to learn that the world does not lend itself to such a convenience any more. Muslims also need to learn that increasingly our struggles are intellectual. As a Muslim living in the West one can have many fears about disagreeing with the media narrative, being labelled a Taliban apologist, a closet extremist, a person mired in 1400 years of hateful history that never was, but perhaps the single most insincere thing that one can do to the society that we now live in is not share our perspective. It is interesting how passionate a debate Malala has generated. Perhaps the most laughable was Bilawal and Bahtawar Bhutto (Last name Zardari?) saying they want her as their Prime-minister. This after unprecedented corruption by the Bhuttos as well as the Sharifs followed by Asif Zardari, a man known internationally for his money laundering and corruption, being installed as the President of Pakistan by the powers that be in and out of Pakistan, A fact Condoleezza Rice narrates in her book ironically named “No higher honour.” It is this manipulation of the fates of millions that breeds resentment against the US that leaves others robbed of their dignity and yes, also leaves the US a scape goat for one’s own failures. One has to wonder about the stunning figures of mortality among children from US policies in just the last 2 decades, not to mention the malnutrition, internal displacement, destruction of families and lost opportunities for education, the thousands of innocents killed in drone attacks and the contrast of parading Malala. She was a face of the children of Pakistan but has been projected as a mask for the atrocities of the West. Even a partial list of children killed in drone strikes speaks of another reality . The media uses her to obscure that Aisha (May Allah be pleased with her) is one of the most prolific narrator of prophetic traditions (Ahadith), that the colonialism has exploited women as much as imperialism does now, that bigots like Lord Cromer in the early 1900’s in Egypt criticizing Islam were opposing women’s right at home in England ) and that a French General had concluded“If you convert 100, 000 young indigenous girls to our civilization …. these young girls, who would naturally become the privileged wives of the most important men of their class will, forever guarantee the subjugation of the country and be the guarantee of its future assimilation. ” Malala is a daughter of Pakistan, a young girl among many who suffer in a country plagued by feudalism, lawlessness, corruption and economic mismanagement, all factors that have helped the US government manipulate Pakistan to its interest while the media keeps people misinformed by creating out of one life what it has denied to millions. Some months ago my daughter had asked about Princess Diana when she watched a video of Diana visiting the Shaukat Khanam Cancer Hospital in Pakistan, one of the biggest philanthropic ventures in Pakistan that serves all Pakistanis regardless of race, religion or color. I told her she was “real princess.” I will teach her the same about Malala for her courage is truly phenomenal and makes me question what I have done to build a better world. I think the biggest lesson this young girl taught me is that if you believe in something then you should be willing to stand up for it. There have been many satirical blogs and articles about how Pakistanis see a conspiracy behind her including by a minority of Pakistanis whose parallax is the convenience of picking a (often profitable) side in a black and world narrative, conveniently overlooking that in the last 10 years Pakistan has seen unprecedented violence, the influx of Black water mercenaries, the interests of its own people sold by the corrupt elite and the likes of Raymond Davis literally getting away with murder. That Humanity in the midst of the never ending war on terror has decided to handle collective affairs on anything other than on power is bound to draw skepticism. “What we committed in the Indies stands out amongst the most unpardonable offenses ever committed against God and mankind and this trade [in American Indian alaves] as the most unjust, evil and cruel among them”. What a non sense as is seen in the concluding paragraph. Just google female literacy rate of Pakistan , FATA/KPK to get your answer. And, Mr. Farhad please do NOT assume that whatever happens in Pakistani done by a pakistani is completely inline with Islam. Because, that is not always the case….